On a busy road in a sector of the city of Panchkula, India, Studio Ardete have designed a relaxing and leisure home for an elderly couple. The project which was completed in 2017 now sits majestically, taking it’s own place in the street and even further gloriously bringing a contemporary character along with it. The concept for the design was to use the courtyard and pool areas as principal elements in design, elevating these two as the focal point of all the spaces within the home. Two individual masses define the facade: one with a screen that has been designed to have vertical elements that reduce visual contact with the busy street outside while at the same time allowing occupants a full view of the trees lining the road across, and the other a distinct mass holding the staircase behind it clad in dark grey textured stone. Small rectangular voids have been created in this facade to break the monotonous mass and add lightness to it. Small windows have been fit in with reflective glasses incorporated to add a sculptural dimension while a water body planned near the entrance sets a tranquil tone for the interiors. The interconnection of spaces within the house by use of transparent walls enhances visual connectivity from one room to the next as well as to the outdoors. The sitting room located at the front of the house is designed as an extension of the landscape with the cantilevered roof reinforcing the connection of the inside to the outside. 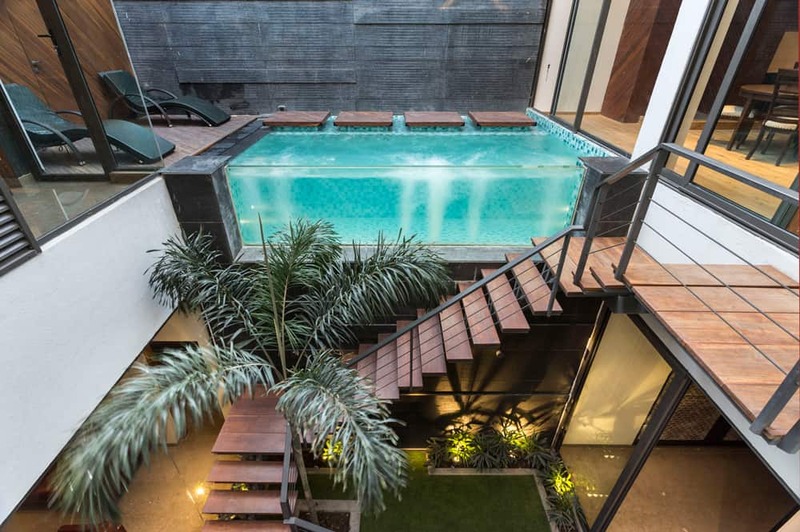 The transparent walls are further used to accentuate the presence of the pool from different areas of the house. The colour, texture and material palettes of the pool yard house have been kept subtle, with use of wood and stone stealing focus. Colourful artwork contrasts against the toned down ambiance of the interiors. In general, the lighting is done taking into consideration individual spaces and their function. Quirky light fixtures, that draw attention and bind the elements of the space together, have been used. Natural light filters in from the double height courtyard, illuminating the spaces inside during the daytime. For an elderly couple, this is a delightful home, awash with daylight, clarity, tranquil, and interiors that enhance the feeling and sense of warmth.